I think one of the best parts of a Hawaiian getaway is the delicious fruit. I seriously look forward to eating ridiculous amounts of pineapple whenever I head to the islands. There is one thing that’s even better than pineapple fruit and that is pineapple ice cream. If you’ve never had Dole Whip, you’re missing out. 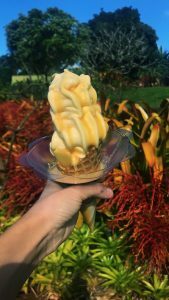 You can get the treat in many forms at the Dole Plantation on the island of Oahu. I highly recommend adding caramel sauce. The combo of pineapple and caramel does not disappoint. Beyond the dreamy desserts, there are a handful of fun, family-friendly activities you can enjoy at the plantation. There is the world’s largest maze, a train tour, and my personal favorite, a garden tour. The maze is a great family activity. I personally am not too into mazes but I saw families having a great time during this activity. It’s also great for getting some cute pictures. There is a giant pineapple formed by the landscaping at the start of the maze… it’s so impressive to see up close! This was hands down my favorite activity. 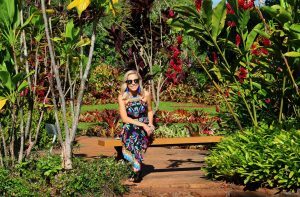 The foliage in Hawaii is so stunning and this self-guided tour gives you the chance to see amazing plants up close, take pictures and even sit on the benches and take in all the beauty surrounding you. We spent 30-40 minutes looking at the plants and I felt like I could stay all day! There is even a waterfall that adds to the serenity of this experience. Check out my video of the tour! The train is sure to be fun for everyone. It’s only two miles long and lasts twenty minutes so if the little ones get restless, it’s not too lengthy of a ride. 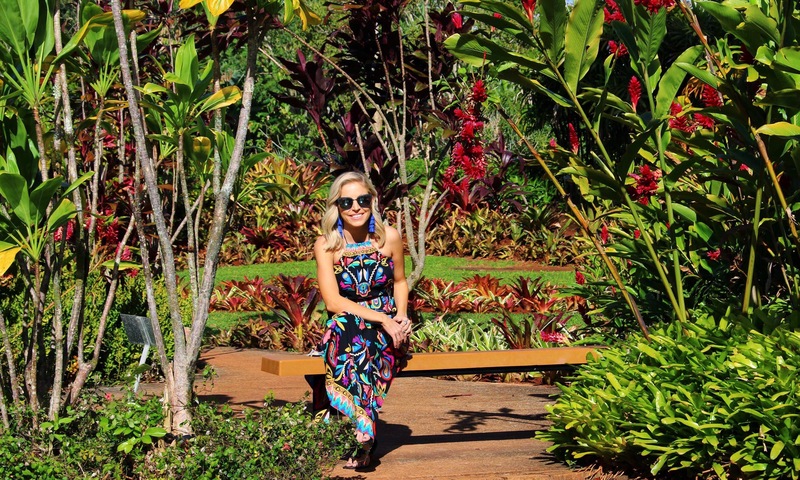 You’ll see amazing scenery and learn about the history of the Dole Plantation. 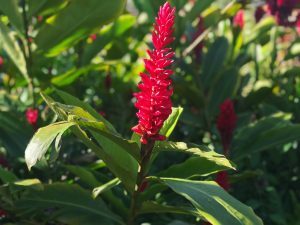 You can save by bundling your activities and make sure you check Groupon because Dole Plantation often posts discounts. Have a great time! To check out the best places to stay in Oahu head here! For my favorite Oahu hike head here!